The Qkfone G998 is no luxury phone, so don’t go making the mistake of purchasing a ‘Mercedes’ for your other half this holiday season. Strange to see Daimler’s famous three-pronged circle emblem located right smack in the middle of its five-way navigator – cheap publicity, perhaps? The Qkfone G998 is no doubt a China-made device and comes in a candybar form factor, dedicated music and gaming controls, dual-band GSM support, a 2 megapixel camera, dual color displays, 1GB of internal memory and Bluetooth 2.0 connectivity. 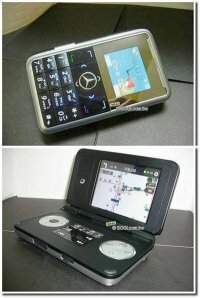 It is powered by the Pocket PC platform.